It's that time of the year again in our family: Birthday season. Within the space on 1 week, there are 6 birthdays in our family (which proves to be very expensive). Everyone also tries to fit their parties within one weekend, so it does get tiring. Here's what I wore to the first party: my uncle's birthday. He hired out a bar for the evening, so I had to look good. There's a funny (embarrasing) story behind the dress. It was on sale at Joy and it instantly caught my eye. It was a small, but it looked slightly bigger, so I decided to try it on. It got on ok, and fitted well. I had trouble taking it off. Like it wouldn't come off. It got stuck around the bust area, and would not get over my head. 15 minutes later, I gave up and went to one of the employees. She laughed and pulled down a zipper that I didn't see...Did I feel stupid! This is what I wore for my birthday, which was only about 12 hours after my uncles party. I love this dress. I got it from Portebello Road Market and it always looks good. I wore it last year during Christmas. And then the following day my aunts did a joint party. I was really tired and kind of gave up on my outfit. 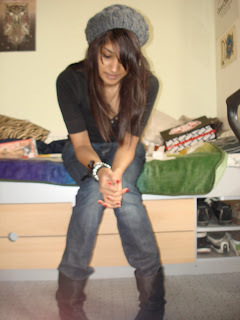 The hat is Aldo, the top in New Look, and the Jeans are H&M. The shoes are from a local shop and the bracelets were a present from a friend. Love your outfits! The first photo is my fave - love the pink dress on you! Such a gorgeous girl! Oh hidden zips, crazy things!! Love that pink dress. And you work the hat too, it looks v cool. At least all the birthdays are in the summer! My family's are all between October and April with no summer ones! The first and second dresses are both so amazing I can't decide which one I like better! And the last outfit, even when it looked like you gave up, you still looked pretty darn stylish! Hee hee. Hate getting stuck in clothes in changing rooms-it's the feeling of panic which only makes things worse and picturing having to rip yourself out of the clothing! That's definitely a lot of birthdays in such a short amount of time! But parties are always fun! Loving all the looks, especially the dress you wore for your party. Love the hat and shoes from the last look! Sherin, I love the outfit you gave up on, lol. The beanie looks so cute on you! Love the dresses too, esp the second one. i love all of these outfits! happy brithday!!!! I'm sending you birthday wishes! Oh geez the story behind the first dress had me shaking with laughter. I have had a similar situation where I really wanted this ring but it didn't come in my size but I tried it on anyways and had to go find my mom to aid in the tugging required to get it off. I love the last outfit, especially the hat! I'm glad someone else likes Hard Candy. All my friends find me strange for enjoying it because it has such a dark subject matter. Love the dresses and the 'can't be bothered' outfit. I always overlook zips and find myself trying to squeeze in and out of garments. blame it on such good design that the zip is so well hidden! I love all the three outfits. You're so versatile! The three of them are so beautiful. I love the pink dress so much!!! That's a lot of birthdays to have in one week... but fun. You look stunning in every outfit.